A mole on the skin is a raised spot that is round. A mole may be large or small and can vary in hue from a dark pink to a brown or black. Moles can appear on various areas of the body and can be removed with the use of certain simple home treatments including a number of essential essential oils. In most instances, you need to use patience when removing a mole with an oil as it cannot be removed as easily as it can in a dermatologist’s office. If you want to naturally remove the oil and keep track of your progress, read on to find out the best essential oils for the job. As noted, a mole is basically a round brown spot. However, a mole can be various colors and textures. Besides dark pink, brown, or black, they can also appear in red, tan, or blue. They can also be displayed as smooth, flat, raised, or wrinkled. Some moles may have hair growing from them. If moles are not round, they are oval in shape. They also are about one-fourth of an inch in size or six millimeters wide. You might compare the size of a mole to that of a pencil eraser. You can find moles just about anywhere on the body, including the armpits, underneath the nails, and even between the toes and fingers. Some moles are found on the scalp as well. Most people have about 10 to 40 moles on their bodies overall and most of the skin lesions appear by the time a person turns 50 years old. Moles can alter in appearance or fade away over time. Pregnancy or certain hormonal changes can cause a mole to appear bigger or darker. Moles develop when skin cells known as melanocytes grow in clumps or cluster. These cells are dispersed throughout the skin and are used to produce melanin or the skin’s natural pigment. The main complication associated with moles is melanoma. Some people have a higher risk of getting this skin cancer than others. Factors that increase the risk include having a large number of moles or displaying unusual moles. When a mole is irregular in shape, it is called a dysplastic nevus. These moles usually are hereditary. These types of moles exhibit centers that are dark brown and lighter, uneven perimeters. You need to watch for changes in moles as they can lead to melanoma. Become familiar with the pattern of your moles and their location. Examine the skin or conduct self-exams each month. You can do this more easily by using a mirror and doing a head-to-toe checkup. Check areas such as the palms, scalp, fingernails, chests, armpits, feet, and legs. Look on the soles and between your fingers and toes. It is important if you have excessive moles that you speak to a doctor about your risk factors and also schedule regular medical exams. To prevent problems with moles, you should use sunscreen year-round. Avoid peak times of the day when the sun’s rays are stronger. For example, you should stay indoors from around 10:00 am to 4:00 pm during the day. Use an SPF sunscreen of at least 15 and apply it generously. Reapply the substance every two hours. Do so more often if you are sweating or swimming. To ensure that you moles do not turn into cancerous lesions, you should use a broad-brimmed hat, sunglasses, long sleeves, and other protective apparel whenever you go out in the sun. Clothing that blocks UV radiation should also be strongly considered. Taking UV precautions is necessary if you have several moles. The following essential oils will hopefully help you get rid of moles and maybe remove your moles once and for all. If you do not want to see a dermatologist about the skin condition and handle it yourself, the following oils can be used to successfully treat the problem. This oil was first used in ancient times by the Egyptians. It has since been used for a number of conditions. Besides removing moles, frankincense is used to relieve stomach disorders and alleviate emotional stress. The oil also assists in balancing out the hormones and strengthening the immune system. Because the oil strengthens the immune system, it is considered ideal for getting rid of moles on the body. Frankincense essential oil is rich in Boswellic Acid, which has been shown to modify and arrest cancerous cell growth (1). While not directly studied, it might assist in reducing mole growths. Frankincense essential oil is also an excellent option to use as after care once your mole has already fallen off. It can also help diminish the appearance of any scars you may be left with. Lavender essential oil is an extremely popular, effective and safe oil with a huge variety of potential uses including getting rid of mole. You can use it alone or combine it with frankincense essential oil for even better effect. The following recipe is simple and effective and many people have found that it can effectively help get rid of their moles. Combine the ingredients in a small bowl and mix them well into a nice, smooth paste. Apply the paste to your mole several tomes a day for between 7 and 14 days and it should hopefully do the trick. This oil can be used in combination with lavender oil and frankincense oil to get rid of moles. Oregano oil not only has antiseptic qualities but it is also known to be an antifungal, antiviral, and antibacterial agent. It is known to be an excellent oil to get rid of moles as well as warts. This oil can be harsh to the skin, however, and should be diluted with a suitable carrier oil like coconut oil or olive oil before use. Dilute one teaspoon of your oregano essential oil with eight teaspoons of your chosen carrier oil and mix it up thoroughly. Apply the oil to your mole or moles once a day for at least a week. Hopefully, you should notice that the mole is disappearing after a week or so. Make sure that you stop this treatment right away if you experience and type of skin irritation. Tea tree oil which is extracted from Australia’s tea tree is another very popular and versatile essential oil. It is widely used to treat a range of skin conditions from acne and eczema to treating cuts and minor wounds. While there are no studies into its effectiveness on moles specifically, the oil has been widely studied for other skin conditions and there is ample anecdotal evidence that it can work to eradicate moles, skin tags and warts. Applying this oil to your mole helps it to dry out and encourages the mole to eventually drop off your skin. Shallow moles without deep roots respond especially well to tea tree essential oil but once again, you must be sure to dilute it with a suitable carrier oil before applying it to your skin. Once diluted, apply the oil to your mole twice a day for at least a week and you should notice the effects. Like oregano oil, clove essential oil is extremely powerful and must be diluted before applying it to your mole. If you apply this oil to your mole several times a day, you should start to see results within a few days but it may take a few weeks before it disappears fully. While the focus of this article is on essential oils for removing moles, there are other home remedies that may prove just as effective. According to many people including experts at the Removing Moles website, you can use castor oil as a safe and effective home treatment. Simply combine a little castor oil with enough baking soda to make a smooth, thick paste then apply it to your mole or moles each night before bed. According to proponents, you should see the mole starting to vanish after just three days but it is likely to take at least a week to completely disappear. When you blend a recipe of essential oils, you can include it in your daily bath or massage it on your body. For example, when you use sea salts and baking soda, this blend can be added to the bath water. This is the best way to make sure that the moles all over your body are fully removed. When you follow the bath routine, the skin lesions begin to fade away in about eight weeks. The more direct method is to apply the essential oil directly to your mole twice a day for a few weeks or until the mole has vanished. Simply take a cotton swab and dip it in your chosen essential oil. Apply the oil to your mole twice a day and repeat until the mole has completely disappeared. It may take a few weeks to vanish entirely depending on the size of the mole and the depth of its roots. Usually, a carrier oil is used to dilute the EOs in an essential oil blend. In the case of mole removal, it is better to directly apply the oils as you do not want to dilute their effect. This may be fine for lavender and frankincense oil but you must dilute stronger oils like oregano and clove. Therefore, as indicated above, it is better to blend essential oils and add them to the bath. You can also blend the oils and apply them directly to the mole. For a direct application, for instance, you may either apply the above blend or apply frankincense directly to the mole two times each day. You should apply the EO for a period of two weeks. Following the process, the mole will begin to darken and eventually fall off. A consistent application of frankincense oil after the mole has disappeared will prevent any scarring. What essential oil removes moles? The best essential oils for mole removal are the ones we have mentioned in this article. Lavender. tea tree and frankincense essential oils are popular choices because pf their skin friendly nature. Oregano and clove oil are also very effective options but are considerably more powerful and must be diluted well before application. Can oregano oil remove moles? Although there is no specific research into the effects of oregano essential oil in removing moles, there is plenty of anecdotal evidence that it works. Oregano oil is a very powerful essential oil and must never be applied to the skin ‘neat’. Make sure that you dilute it in a suitable carrier oil before applying it and stop using it immediately of your skin reacts. How does apple cider vinegar get rid of moles? As well as the essential oils mentioned in this article, there are other potential home treatments including apple cider vinegar. ACV can help dry out the mole and allow it to drop off of its own accord. If you want to make sure that you remove a mole, it is best to apply an EO directly to the site. You can also use EOs such as frankincense oil and lavender oil in the bath. If you do apply the oil directly, choose frankincense. You may also use oregano oil for the same purpose. However, this oil can be harsh to the skin and should be mixed with a carrier oil such as olive oil. This oil proves to be an exception in this case as most oils should be applied directly in a blend or separately to glean the best results. Usually, a carrier oil is not used to dilute the substance. Otherwise, the formula will not work as effectively. By using an essential oil, you will see progress faster when the oils are used in a bath. Usually, it takes about eight weeks to get rid of the moles. If the oil or oils are applied directly, you will see progress in about 14 days. Make sure that you know which oils have the best effect. In this case, the oils include frankincense, lavender, and oregano. Whatever you choose in an oil or however you choose to apply it, you will receive good results provided that you are consistent and patient. To make a choice of an essential oil, you need to test the substances. Find out which oil agrees the most with your skin type. As noted, oregano oil can be harsh and may not be the oil for you. To make sure that you choose the right oil, test the oil on the site where you plan to remove the mole. You can find out if you have an allergic reaction to the substance. If nothing happens, you are good to go. You will find that this form of mole removal is better than seeing a doctor, especially if you want to track the progress yourself. 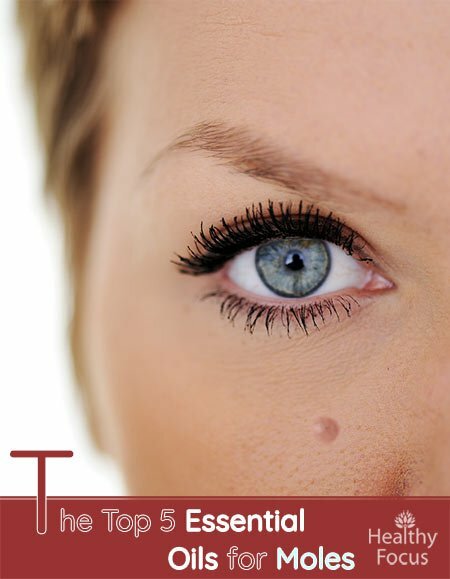 Review your options today and you will find that this form of mole removal is less invasive and less stressful. You can also use the oils for aromatherapy to relieve stress and give you a whole new lease on life. Use the oils for massage and direct application via the bath for removing moles and warts.